F.M. Alexander publishes from beyond the grave? A prank or plagiarism or some of both? F.M. Alexander (1869 – 1955) apparently has the power to publish posthumously. 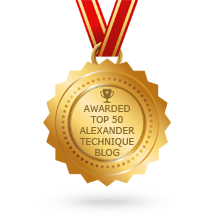 I believe the technique is transformational on every level — after all, I’ve devoted the last 27 years of my life to studying and teaching the Alexander Technique. There’s even a gold standard randomized controlled trial with a very large sample size (N = 579) showing that the technique is a low-cost, effective means of solving back pain (see: http://www.bmj.com/content/337/bmj.a884 ), but I’ve never heard of any paranormal effects. Will the real author please step up? https://www.bodyproject.us/wp/wp-content/uploads/2017/07/logobg.png 0 0 Elyse Shafarman https://www.bodyproject.us/wp/wp-content/uploads/2017/07/logobg.png Elyse Shafarman2014-08-26 17:53:242014-08-26 17:58:17F.M. Alexander publishes from beyond the grave? A prank or plagiarism or some of both? 3-D breathing, adapted from Betsy Polatin’s wonderful new book, The Actors Secret, helps you experience optimal movement of the ribs and torso during breath. 1. Front to back dimension: Place a hand on your belly and a hand on your low back. You will naturally feel your belly expand and deflate as you breathe. You can also feel more subtle movement in your low back. Visualize more of the breath movement happening in your back. This will help widen and relax the back muscles. Do you feel more movement in your back after visualizing? Next, bring a hand on your sternum and a hand on your back near your shoulder blades. If your shoulders are too tight to easily reach your back, you can place a hand on a friend’s back to feel their breath movement. Yours will be similar. Remove your hands and sense your own breath movement. Did you know that most of your lung tissue is in the back of your body? 2. Side to side dimension: Place your hands as comfortably as you can on your side ribs. Feel the horizontal expansion of your ribs as you inhale. Feel the deflation of your ribs as you exhale. Stay for a few breaths. Remove your hands and sense your rib motion. 3. Bottom to top dimension: Place a hand above your collar bone on your uppermost rib (yes, there’s a rib above your collar bone!). Place a hand below your sit bone or at your perineum. Feel the rise of the upper ribs, and the fall of your pelvic floor as you inhale. As you exhale, you may feel the pelvic floor rise and the spine lengthen upwards. If you can’t sense anything at first, take a few big breaths as if you were at the doctor’s office. Once you get the feeling, breathe normally. Then remove your hands and sense the movement. Which dimensions of breathing are familiar to you? Which do you use rarely? Does the act of noticing your breathing automatically improve the quality? Is your breath smoother, deeper, or easier in any way? In your day-to-day life, start by sensing one breath dimension at a time. Can you sense your breath while talking on the phone, eating, or texting?